Nadler Institute of Archaeology | XKV8R: The Official Blog of Robert R. Cargill, Ph.D.
בלגן (balagan): noun. (modern Hebrew, from Russian). 1) a chaotic mess of confusion and nonsense. 2) a state of extreme confusion and disorder. There is something quite foul coming from Israel, being wafted about by the pages of Biblical Archaeology Review, and perhaps not surprisingly, the stench appears to be pointing back to Robert Deutsch and Simcha Jacobovici. Archaeology professors from the Nadler Institute of Archaeology at Tel Aviv University recently responded to a cheap and petty series of attacks on the integrity and archaeological methodology of one of their own, Dr. Yuval Goren, Professor of Archaeology at Tel Aviv University. 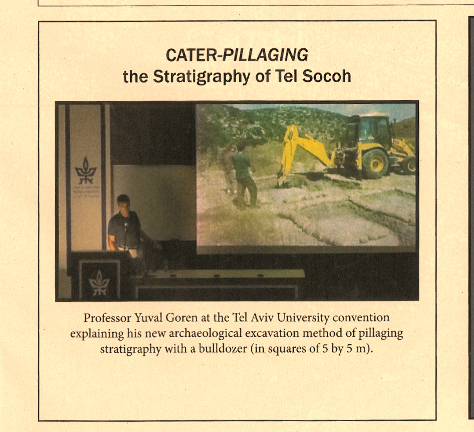 The attack comes in the form of a paid advertisement published in the most recent issues of Biblical Archaeological Review (BAR), which accuses Prof. Goren of “CATER-PILLAGING the Stratigraphy of Tel Socoh”. The ad features a photo of Prof. Goren standing in front of a JCB, a mechanical backhoe. An anonymous advertisement depicting Prof. Yuval Goren of Tel Aviv University (later revealed to have been paid for and placed by Robert Deutsch) appears in the May/June 2013 issue of Biblical Archaeology Review on page 29.
four towns impressed on the so called royal LMLK jar handles from the time Hezekiah king of Judah. Instead of advanced nano-archaeological investigation we see destructive mecano-archaeology. What the anonymous, unsigned ad on the pages of BAR does not state, what the email above Archaeonews email does not claim, but what I confirmed in a phone conversation with an administrator at BAR immediately after the initial appearance of the ad, is that the BAR ad was paid for and placed by none other than Israeli antiquities dealer Robert Deutsch, who was indicted by an Israeli court a few years ago as a co-conspirator with antiquities dealer Oded Golan, who was indicted for, among other things, allegedly forging an inscription that purportedly reads, “Jacob (or James), Son of Joseph, Brother of Joshua (or Jesus)”, on what has come to be called the “James Ossuary“. BAR didn’t run a story, rather, that photo and the caption around it was actually a 1/4 page ad taken out and paid for by non-other than Robert Deutsch. He had originally spammed a bunch of us trying to get bloggers to give his ‘ad’ a little publicity. Deutch’s claims are, of course, deliberately misleading. So we now have confirmation that Robert Deutsch purchased and placed the anonymous, unsigned ads criticizing Prof. Goren in the pages of BAR for using a mechanical excavator. But why would Robert Deutsch do this? What possible motive would Mr. Deutsch have for attacking a professional archaeologist anonymously? BAR also published Deutsch’s intent to sue the IAA, and followed it with the publication of a separate article entitled “Robert Deutsch to Sue IAA“, which largely echoed comments he made elsewhere on blogs and message boards. Indeed, can we now state that it appears Mr. Deutsch has begun his campaign of revenge, at least against Prof. Goren? Golan and Deutsch were acquitted of antiquities forgery at the trial’s conclusion when the judge ruled that there was not enough evidence to prove that Golan executed the inscribed text on the ossuary. However, the judge also warned that the acquittal of Golan on forgery charges should not be read as a judgment on the authenticity of the ossuary nor its inscription, which a healthy majority of scholars consider to be a forgery. What is not immediately apparent is that the BAR ad is a complete misrepresentation of the facts, and suggests a number of outright falsehoods. For one, the piece of equipment is not a Caterpillar, nor a bulldozer, but a JCB backhoe loader with a loader on the front end and a bucket scoop (or “backhoe”) on the back. Second, the JCB is not on the Sochoh archaeological tel, but in the valley below. Archaeological squares were opened to ensure the careful, controlled excavation of the wadi below. Third, Prof. Goren’s excavations at Tel Sochoh were carried out using the highest archaeological standards and methodology. As a supervisor at Sochoh’s partner excavation, Tel Azekah (we shared office, lab, and classroom space at Nes Harim), I witnessed daily the extraordinary care taken with the materials and stratigraphic evidence from the Tel Sochoh site. All finds were processed with the highest standards and archaeological contexts were preserved with the utmost detail. 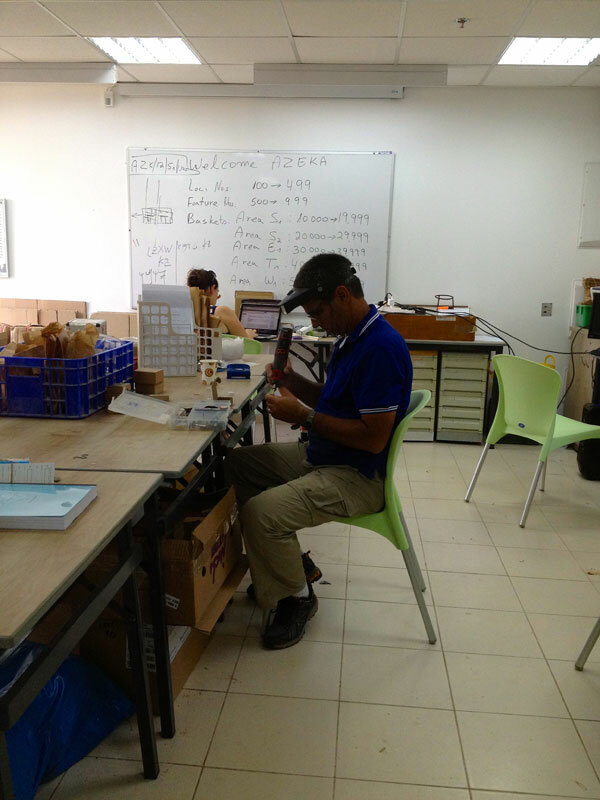 Prof. Yuval Goren works in the archaeological office at Nes Harim, which houses the staff of the Sochoh and Azekah archaeological excavations. I took this photo from my station in the lab. Fourth, the use of mechanical excavators is minimal, but common in modern archaeology. Mechanical excavators are commonly used to clean areas in preparation for manual excavation, remove heavy debris like stones and felled trees, to remove previously excavated and replaced backfill documented in prior excavations, and to open controlled test probes for the purposes of determining whether assets should be deployed to new area for the purposes of manual excavation in areas where ground penetrating radar is unable to yield verifiable results. What tools do archaeologists use for excavation? Nearly every archaeological tel I’ve ever been associated with has used a mechanical excavator at one point or another. This much was made clear by Yuval Goren’s response to the initial ad, demonstrating that nearly every modern excavation in Israel employs mechanical excavators in their excavations. 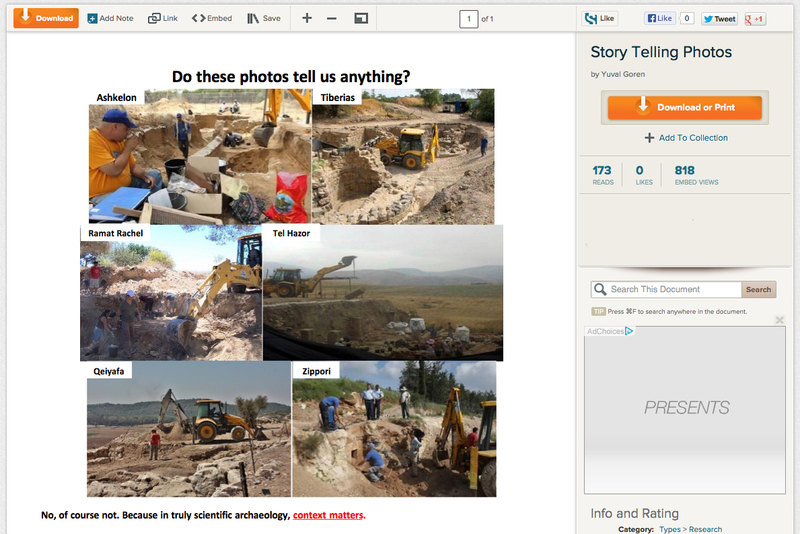 Prof. Yuval Goren responds to criticism of the use of mechanical excavators with a short article on Scribd, which includes a montage of different modern excavations all using mechanical excavators. Ironically, one archaeological site that Prof. Goren left out of his montage is the site of Bethsaida, excavated by Prof. Rami Arav of the University of Nebraska, Omaha. 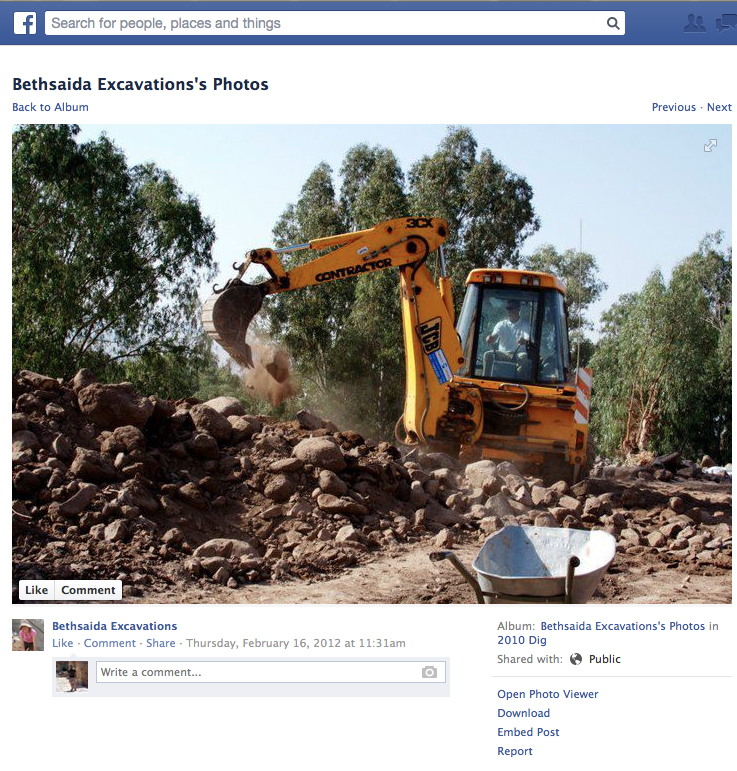 The Bethsaida Facebook page proudly displays publicly accessible photos of their use of mechanical excavators (JCB backhoe loaders to be precise). “I am delighted to see the interest in the Bethsaida Excavation Project. This project is an interactive educational project. We have just completed the 27 excavation season. Bethsaida was proved to be the capital city of the kingdom of Geshur. Where else we have a capital city of a kingdom in such a great state of preservation? (Backhoes are used at Bethsaida only to remove dumps. The picture you see is removing dumps outside of the city walls. All backhoes jobs at Bethsaida are approved and supervised by IAA). Anyway, thanks for your interest at Bethsaida. It is indeed an amazing site without parallel. 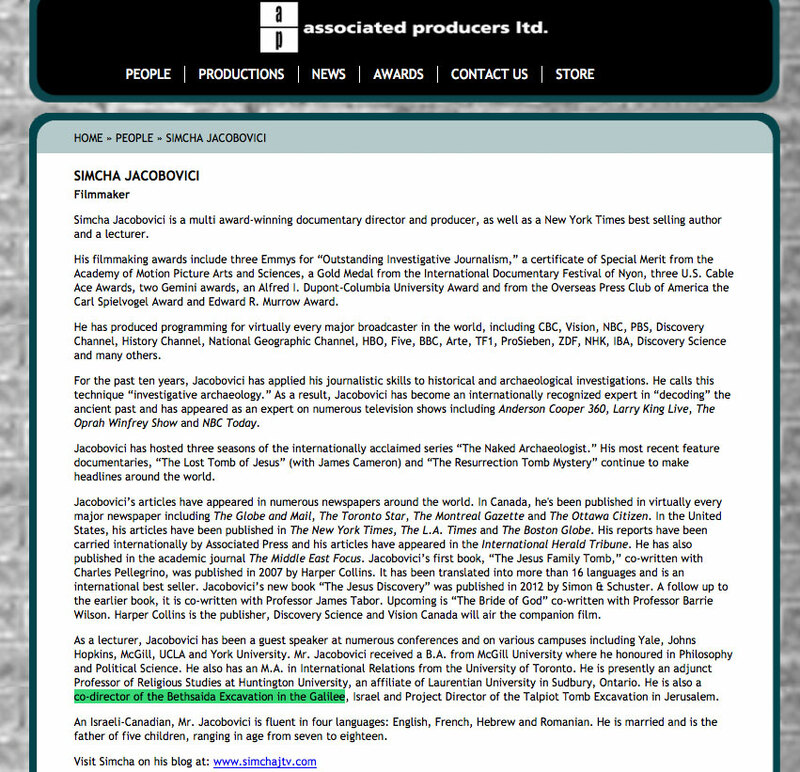 Simcha Jacobovici’s biography at his company’s Associated Producers, Ltd.) website claims that he is a “co-director of the Bethsaida Excavation in the Galilee, Israel”. The truth is that Mr. Jacobovici holds the honorary title of “Co-Director of the Bethsaida Excavations” (along with ten other individuals) because he serves as the leader of the Huntington University (of Canada) delegation, which contributed $2000 to the Bethsaida Excavations Consortium. The honorary “Co-Directors” have no authority over the site, nor the excavations. They are invited to attend an annual meeting, and are permitted to list themselves as “Co-Directors” as the leaders of a contributing consortium institutions. Because Mr. Jacobovici states that he was named as an adjunct professor at Huntington University (see image above), and because Huntington University is a contributing consortium member, Simcha Jacobovici can list the title of “Co-Director of the Bethsaida Excavations” on his resume, although the title is largely honorific, similar to those donors who give to a university and are rewarded with a honorific seat on a “University Board”, as opposed to those who are appointed to a university’s “Board of Regents”, and who exercise actual authority over the institution. Thus, the use of mechanical excavators is endorsed by the Israel Antiquities Authority and is used by the best and most reputable archaeologists in the field. (NOTE: One should remember that the claim that “no one would go on record endorsing the bulldozer methodology” likely has more to do with the one asking the question (namely, Mr. Jacobovici), and less to do with standard archaeological practice. Given their past experience with certain sensationalizing individuals pretending to be archaeologists on TV, the IAA may very well have developed a practice of not responding to certain archaeological amateurs and others who are only looking to misrepresent any answer the IAA might give. Their silence is likely a result of the person asking the question, not practice in question. 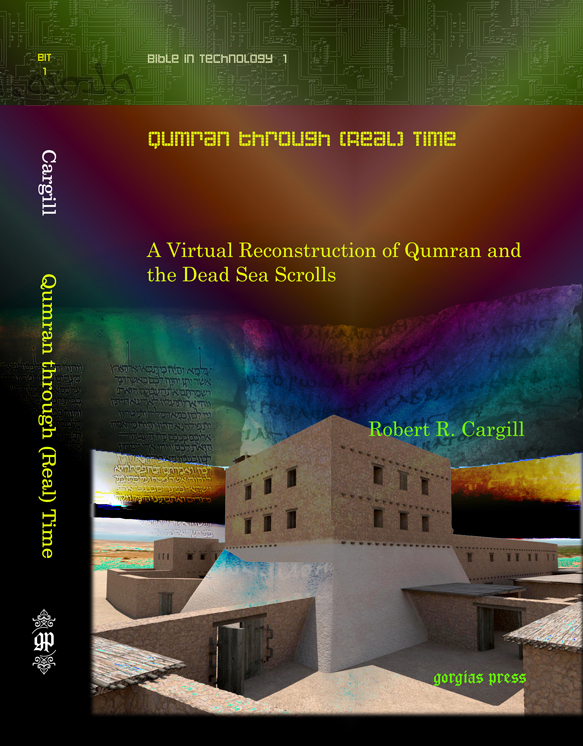 This brings us to the joint response from a host of archaeology professors at Tel Aviv University, which clearly spells out the case I have made above. 1. There was no use of a mechanical excavator on Tel Socoh. 2. The slide shown in the ad illustrates work carried out in a wadi near the mound, as a sequel to a systematic manual excavation from surface to natural soil nearby. The sounding was aimed at detecting pottery and slag in the vicinity of the site. This method is authorized (and endorsed) by the Israel Antiquities Authority. 3. This is a common method in archaeology. Most seasoned archaeologists – regardless of period of research, location on the globe, and institutional affiliation – use mechanical excavators in certain, closely controlled circumstances. Thus, it is abundantly clear that mechanical excavators are a part of the standard tool box available to modern, licensed, approved archaeologists. This is not in question. It is legal. It is legitimate. It is approved by the IAA in licensed excavations. Mechanical backhoes are present at some point or another at just about every site. There is nothing wrong with the use of mechanical excavators in controlled archaeological contexts. This is fact. This is standard practice among professional archaeologists. So we must return to our initial question: Why is Robert Deutsch paying for anonymous ads in Biblical Archaeology Review that accuse Prof. Yuval Goren of “Cater-pillaging” archaeological sites? 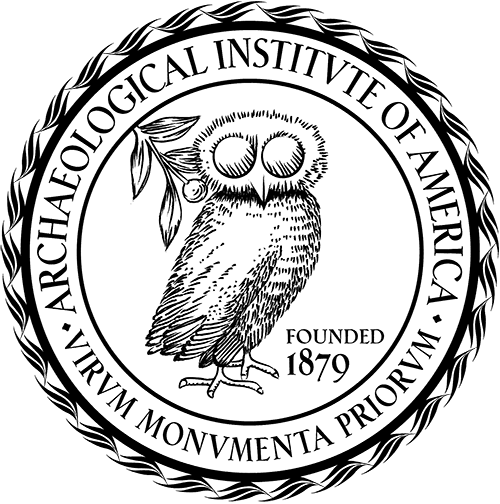 Given Mr. Deutch’s history with Prof. Goren, and given his public vow to retaliate against those involved in the IAA’s case against him, one cannot help but consider the possibility that this uninformed, unsigned ad, which is a deliberate misrepresentation of standard archaeological methodology, within the pages of BAR is, in fact, an attempt to sully the name and professional credibility of an established archaeological professional, namely, Prof. Yuval Goren. If this is the case, one can understand why Robert Deutsch did not want to sign his name to the ad. As it is potentially defamatory, Robert Deutsch would be wise to take all precautions necessary to avoid the appearance that he is paying money to make false accusations and insinuations about the professional practices of Prof. Goren in the pages of BAR. Of course, the irony is that THERE IS NO CONTROVERSY! It is a completely manufactured attempt at character assassination. Any “controversy” is the contrivance of Robert Deutsch (via his “anonymous” paid advertisements), and the opportunistic bandwagonning of Simcha Jacobovici and his PR machine. 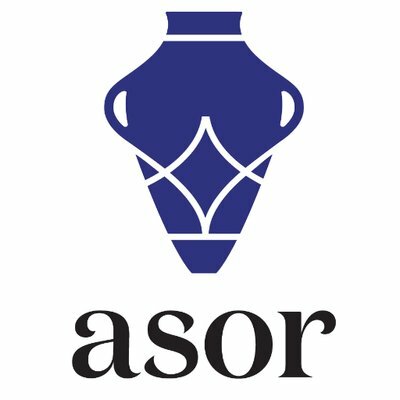 Furthermore, one might conclude that this manufactured controversy may or may not be a continued attempt at retaliation against Prof. Goren for testifying not only against Oded Golan, but against the very authenticity of the so-called “James Ossuary” in an Israel forgery trial that concluded last year. Indeed, the claim of the authenticity of the “James Ossuary” is one thing shared in common by Mr. Deutsch, Mr. Jacobovici, and BAR Editor-In-Chief Hershel Shanks. The ad is intended to smear the reputation of Prof. Goren. That is its sole purpose. It is not journalism, it is a paid attack ad. And now that the truth has been made public, this causes potential legal trouble for Robert Deutsch and BAR. And this brings us to the recent efforts of Simcha Jacobovici. Readers should continue to dismiss Mr. Jacobovici’s colorful imagination, who views the facts of this particular case as something that must be obscured until is fits whatever conspiratorial theory he is arguing this week. And this week, it is backhoes at Tel Sochoh (but apparently nowhere else). At no point is this more evident than Mr. Jacobovici’s recent series of blog posts, in which he compounds mistake upon mistake, and hypocrisy upon hypocrisy. In fact, at one point, Mr. Jacobovici’s attempts at fanning the flames of this manufactured controversy became so irresponsible (and glaringly self-evident), that he has already had to issue an apology for citing a dead woman as testifying in his own defense. Now, not only is Mario Martin (as brilliant as he is) a post-doc and not a faculty member at Tel Aviv University, but Mr. Jacobovici appallingly listed the deceased Orna Zimhoni as one who consciously did not sign the statement! (Mr. Jacobovici later issued a apology, but only via email, and not on his blog. Mr. Jacobovici simply corrected his mistake by deleting the name of Ms. Zimhoni from his blog post, and now apparently from his Times of Israel editorial, which now also appears corrected.) This opportunistic, yet highly insensitive attempt to use a deceased archaeologist in support of his claim, only demonstrates Mr. Jacobovici’s lack of research ability and his underscores his careless rush to condemn those with whom he disagrees. But we have come to expect this of Mr. Jacobovici: facts are merely optional nuisances, and the dead will speak on his behalf if his opportunism finds it convenient. For shame, Simcha, seriously. Is this the kind of “investigative research” we are to expect from Mr. Jacobovici? The dead now speak on your behalf? I shake my head. But it gets worse. There is a much greater hypocrisy present in Mr. Jacobovici’s recent blog posts, and I’m not sure whether we’re dealing with sheer ignorance, sheer stupidity, or sheer hypocrisy. I fear we are dealing with all three. 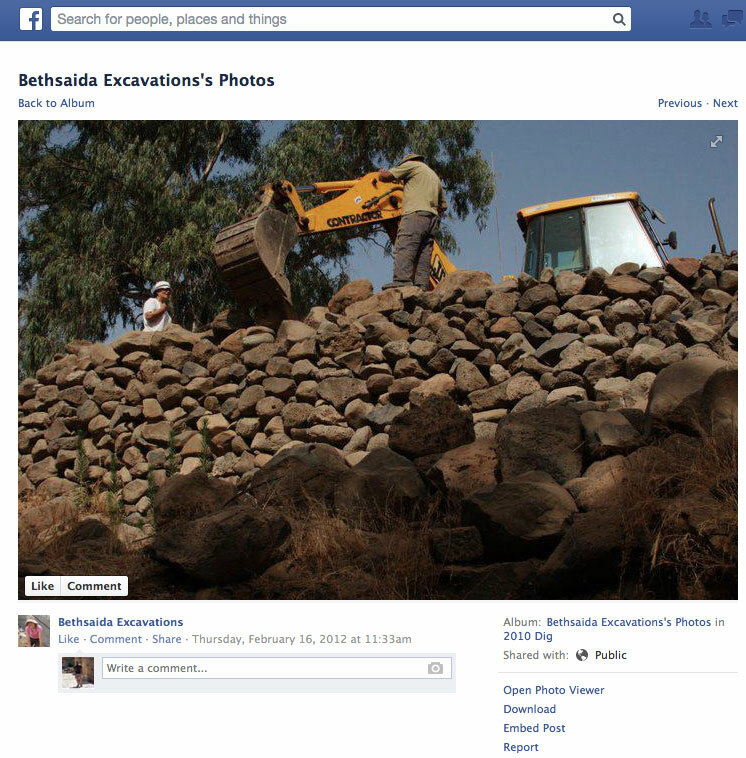 After bloviating incessantly about the use of mechanical excavators in multiple posts on his blog this past week, it was revealed that the very Bethsaida excavation of which Mr. Jacobovici claims to “Co-Director”, ALSO USES MECHANICAL EXCAVATORS!! (See the images above.) Simcha’s ignorance of standard archaeological practice is surpassed only by his own hypocrisy. Rami Arav can use mechanical backhoes at Bethsaida, but Prof. Goren cannot at Tel Sochoh? This makes sense? Simcha Jacobovici has the archaeological credibility of a 30 shekel note*: it appears legit to those who don’t know any better, but anyone who has ever done archaeology in Israel knows that it’s fake, fake, fake. Simcha Jacobovici reminds me of the pundits who appear on CNN during political campaigns right after the debates, whose professional job it is to feign outrage at “controversies” manufactured the campaigns paying them to do so. But shaking one’s head is all one can really do for this entire sad, manufactured episode that can only be described with one word: בלגן (balagan), a chaotic mess of confusion and nonsense. 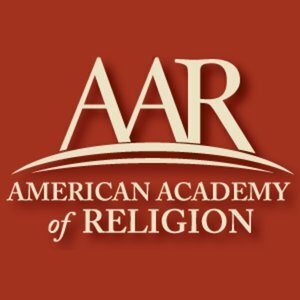 The sensationalist, vindictive triumvirate of Robert Deutsch, Simcha Jacobovici, and sadly (and again, surprisingly, given their recent progress), Biblical Archaeology Review, has manufactured a false controversy for the purposes of defaming a good scholar, Prof. Yuval Goren, who happens to disagree with them regarding the James Ossuary. It has become one big balagan, and the only appropriate action for legitimate scholars, real archaeologists, and the public to take is to shake their heads at Mr. Deutsch and Mr. Jacobovici and ignore them. Ignore their false claims. Ignore their manufactured controversies. And ignore their petty, vindictive contrivances. Robert Deutsch is misrepresenting the work of Prof. Yuval Goren, and yet didn’t even have the backbone to sign or state the origin of his defamatory advert. Likewise, Mr. Jacobovici is taking his typical, opportunistic verbal swings at real archaeologists by parroting Mr. Deutsch’s misrepresentation of the facts. Therefore, it is time for the academic world and the general public once again to ignore Mr. Jacobovici and Mr. Deutsch, as throughout this entire balagan, they have more than demonstrated their lack of credibility, rush to judgment, and mistreatment of simple facts. For them, the truth is a simple nuisance which must be spun, massaged, manipulated, obscured, and sensationalized into armaments for their own personal PR battles. The best thing to do is to illuminate the truth, expose the facts, demonstrate the PR-driven falsehood of the entire episode, and then ignore them both, for that would be the most powerful and most effective response of all. And as for Robert Deutsch, the academy should continue to remain vigilant as he continues to exact the retribution he has vowed repeatedly to take. If he attempts another cowardly anonymous campaign of character assassination against someone he feels has wronged him, fear not: just follow the money and shine a light into the darkness, and his duplicity will be exposed, just as it has been in this entire balagan. For in this regrettable episode, Mr. Deutsch and Mr. Jacobovici have failed in a spectacular way. And they will once again be relegated to the periphery, where the din of the ignorant, the vindictive, and the conspiratorial is occasionally loud, but is ultimately ignored and forgotten. So, to what shall I compare the archaeological credibility of Mr. Jacobovici and Mr. Deutsch following this entire balagan perpetrated by their own self interests? They are not unlike a piece of basalt, which at first appeared shiny and impressive in the archaeological square. But after archaeologists and scholars dug a little deeper, they soon realized the basalt was a hard, stubborn, intrusive nuisance to the remainder of the archaeological activity being done all around it. So what did they do? And what became of the piece of intrusive basalt? The archaeologists sledged it repeatedly (with logic, of course) until it was broken it into multiple fragments (of debunked rhetoric, of course), and safely removed it from the archaeological square…with a JCB, of course. 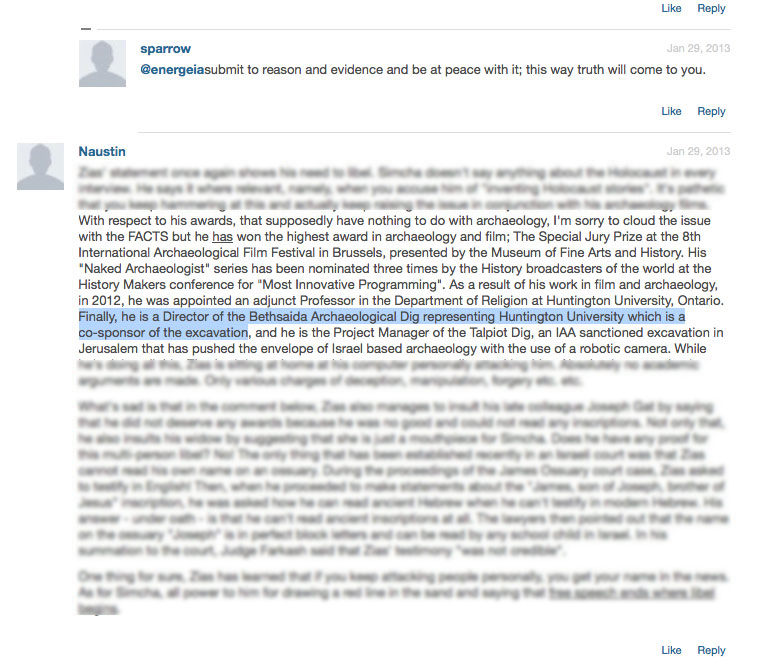 UPDATE 1: Noah Wiener, the Web Editor for the Biblical Archaeology Society website, contacted me to notify me that he has located the broken link to the “Robert Deutsch to Sue the IAA” article and has fixed it. You can access the article here. To adjust for the correction, I have altered the original line: “(It may be worth noting, however, that a separate BAR article entitled “Robert Deutsch to Sue IAA” has mysteriously disappeared from the BAR website. )” to reflect the corrected link. *UPDATE 2: It occurs to me that some not familiar with Israeli currency might not realize that there is no such thing as a 30 shekel note. It’s like a $3 bill. They do not exist. Any that do are fake.